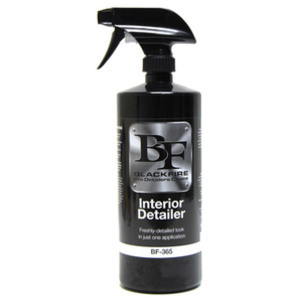 Blackfire Interior Detailer is a quick detail spray for car interiors that cleans and protects surfaces in one step. This interior detailer can be used on all interior surfaces including leather, vinyl, rubber, plastic and even sat nav screens. It leaves a freshly-detailed look in just one application and is ideal to quicken up the interior cleaning process. Interior Detailer removes dust, light dirt, fingerprints, smudges and more. In addition to cleaning it also leaves behind a layer of protection that guards against UV rays. Shake well. Do not apply to hot surfaces. Spray onto surface to be cleaned. Use a clean microfibre cloth to wipe away dirt. Flip to a dry side and buff away excess product. Alternatively, and to avoid overspray - spray onto microfibre cloth and then apply to surface to be cleaned.